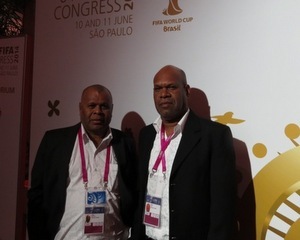 The delegation left the country last week and includes SIFF chief executive officer, Neil Poloso, and normalising committee member, Henry Kapu. There the delegation also attended the OFC Congress while Anga sat in at the OFC Executive Committee meeting prior to the congress. The delegation brings with them a significant agenda aimed focussed on the recovery efforts underway at SIFF. Discussions will be centered on the SIFF Road Map which outlines the objectives and strategies mandated to the SIFF Normalising Committee. Most important for Anga and his delegation will be the opportunity to speak directly with FIFA officials on some of the matters relating to the Road Map. Prior to their departure SIFF had booked several meetings with FIFA department heads and it is hoped that this meetings will help develop a clear path for the SIFF Normalising Committee. “This is an invaluable opportunity for us to meet and discuss matters inherent to the recovery process at SIFF on a face to face basis. We look forward to making full use of this opportunity and return home with some concrete strategies to address the outstanding issues,” Anga says. The answers obtained by Anga and his team will surely define the course of local football over the next six months and surely its shape in the future. This information is being eagerly waited for by SIFF’s member associations, business houses, other stakeholders and the public. While in Brazil trio will also have the opportunity to witness the opening ceremony of the 2014 FIFA World Cup and watch the first of the tournament match between hosts and Croatia. The delegation is expected back in the country on June 17.